Morning, welcome to day 2. It's early isn't it, hey yes. Was the welcome to my local to my local Apple store this morning, no less enthusiastic than the day before. Greeting as we were by at least one presenter from the day before, with the addition of an expert in iPhoto and iMovie. As we arrive we were name checked, for my son and I, this was made easier for the presenter by my sons reluctance to remove his Apple t-shirt and land yard from the day before. What was a genius, was we were seated in from of specific MacBook Airs, this didn't become apparent until all our campers were around the Apple camp fire. 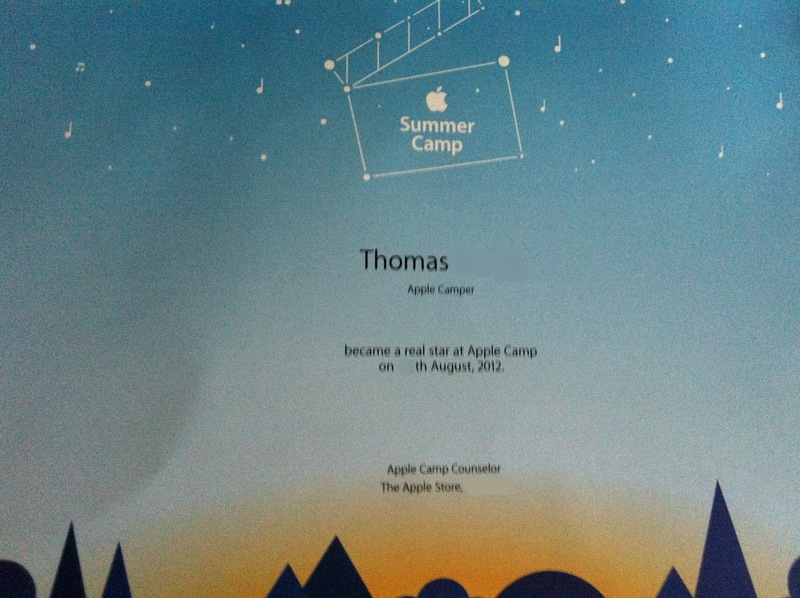 When Thomas, the boy, opened his MacBook Air, a personalised wallpaper welcomed him to day 2, in addition his soundtrack file from day 1 was waiting in a personally named folder on the desktop. It's the little things, it's the detail and Apple never misses the detail. Like our presenters today, film lovers, how do I know this because the talk passionately about the favourite film or genre and engage with us to share ours. Our presenter today's favourite film is Lord of the rings and Aliens, so much so she named her two rescued cats after characters in those films. You see this is what I am saying, you can't fake staff who care, staff who's passion is infectious. As a group we were lightly schooled in iPhoto to start, nothing heavy, just enough to inspire our young ones minds. Crucially then, given time to be creative. In fact employees not directly involved in the camp would periodically come within earshot and state to our presenters, "this is what it should be like" or "the store is alive, it's great". With iPhoto we imported our footage and subsequently used iMovie to edit it and add our previously created soundtrack at the crucial moment. Gradually we were shown extra functionality to polish our young ones vision. Titles were added, different effects experimented with and timings adjusted. Towards the end of the day the students were gifted their own memory stick to take away their masterpiece. One by one the young directors were called to the front to be to be rewarded with a personal certificate and selection of fabric badges. To recap the students (with their parents support, superior intellect and everyday unbranded T-shirts) have created the soundtrack to their offsprings reportage. Day 3 will be a film festival showcase of everyone's first time flick.